This is two coats topped w/ Seche Vite. Application was good, smooth and even, and dried lightning fast with SV. On another note, I am testing Instant Artificials as my basecoat and so far I am loving it. I had a crazy week last week and didn't get to paint my nails for a few days, but 2 coats of Instant Artificials made then nice and strong, and the clear polish didn't peel off as I find clear polish often does after a day or so. I went almost 5 days with my chipping/peeling of the polish. 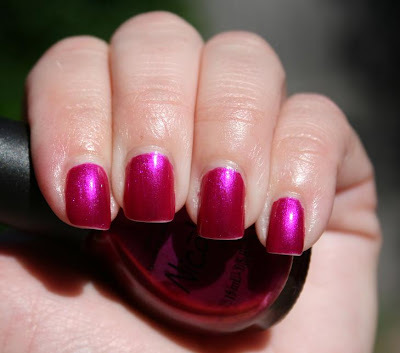 Disclosure: This Nicole polish was provided to me by a PR firm for review purposes. It's a beautiful color! Yeah, it's definitely more pink than purple.